*Colin Munro is their leading run scorer. But he has got out cheaply in last couple of match. He will look to score big in this match. *B McCullum and Darren Bravo has also contributed well with the bat. *Colin Ingram scored run a ball 25 runs in qualifier 1. He is likely to bat 1 down. *Move of promoting Dinesh Ramdin has brought wonders for them. Barring last match, he has played well in last couple of match. He will bat 2 down. *In Qualifier-1, Knight Riders once again sent Sunil Narine to open the innings with bat. He is in very poor batting form, so he is likely to be dropped in lower order. *Ali Khan , Dwayne Bravo and Kevon Cooper and also bowled economically. *Evin Lewis got injured in last match. So his fitness is still a sign of concern. Also the fact, he hasn’t been consistent this season, so it’s better to omit him from team. *Mamudullah will not play today as he has gone to participate in asia cup. *Saad Bin Zafar is named as his replacement. 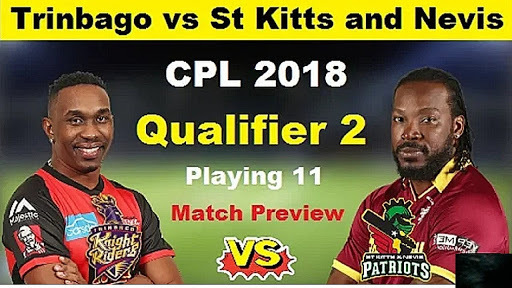 *Chris Gayle and Ewin Lewis (if fit) will open the inning for the team. *RV Dussen will bat 1 down. He has played well in the limited opportunity he has got. *A Devcich made crucial 50 runs for them at a strike rate of above 200. He is likely to bat 2 down. *Ben Cutting, F Allen and B King will play finishing role. *F Allen too have contributed with bat in last couple of matches. He can be promoted anytime for late hitting. He is also a spin bowling option. *Ben Cutting is good all-rounder. He scored crucial runs in last over to help the team cross the line. He also bowl 4 overs and have nack of picking wickets. *T Shamsi and F Allen will lead the spin attack. *S Cottrell can replace H Walsh in playing lineup. *B Cutting and C Brathwaite will lead the pace attack of the team. 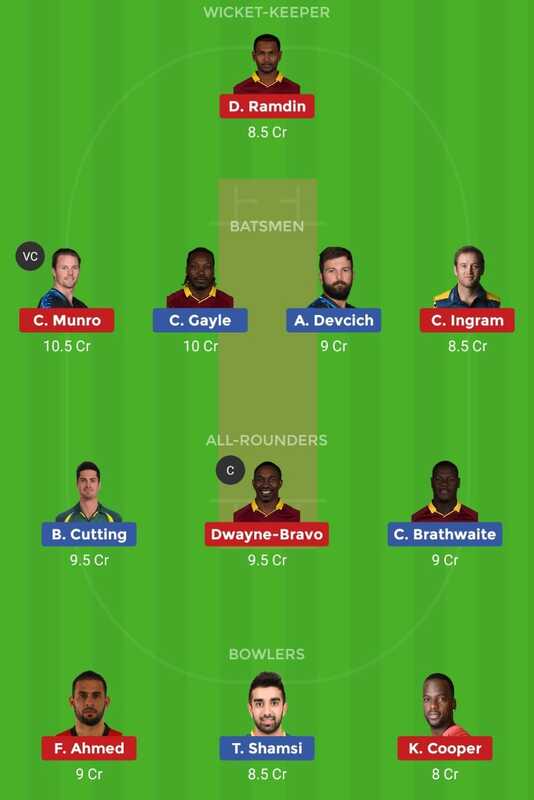 🌟 You can replace S Narain in place of C Braithwaite as per your choice.